After explaining what I have been getting up to over the last few years, people will often ask me “why dragonflies?”. In all honesty, I love hearing this question because there are so many reasons why dragonflies are amongst the most interesting of insects to study. So here are my top 5. 1. Dragonflies have the best eyesight in the insect world. Evolution has reduced the dragonfly’s antennae into short stubs. In flight there is no requirement for antenna and so the eyes of dragonflies have evolved to accommodate the majority of the head. Unlike most insects, it is possible to relate to the behaviour of a dragonfly as we utilise the same key sense; vision. Often some of the larger dragonflies, especially the emperor in the UK, will fly at the observer, showing curiosity and/or territoriality, which we understand. They are insects with a purpose, unlike an earwig. 2. The aerial abilities of a dragonfly in flight are unmatched by anything else on earth. Dragonflies can fly in any direction, on any axis, can change direction without slowing, and can even fly upside down. 3. Dragonflies are stunning insects – I think even more beautiful than butterflies but that’s a matter of opinion. 4. The most voracious predators on earth. Dragonflies are carnivorous, preying on most flying insects, butterflies and even smaller species of dragonflies. Their legs are armed with an array of bristles which, when brought together, form a basket in which prey is captured. Biting mouthparts then clip off any large wings, before chewing up the prey, whilst in flight or perched. Observations have been made of large hawker dragonflies picking up small juvenile frogs from the ground. Meganeura was a genus of insects from the Carboniferous period (300 m.y.a.) 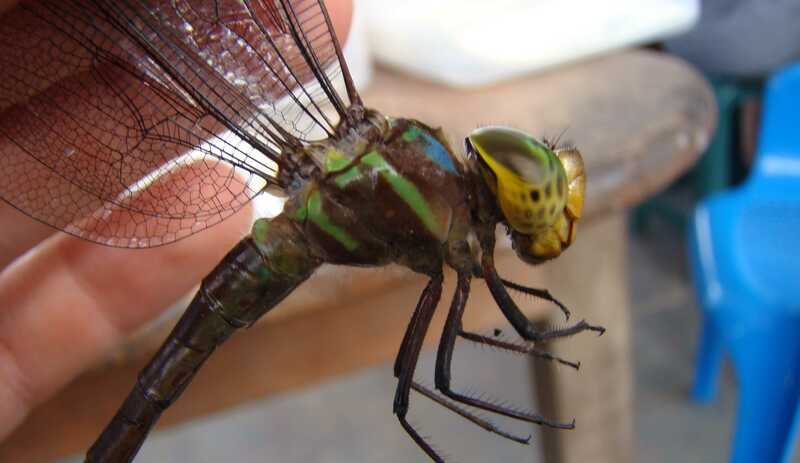 that closely resembled the modern dragonfly and had a wingspan of 45cm, they must have been formidable predators. They would have preyed on equally massive herbivorous insects. 5. In much of the world mosquitoes make up large volumes of a dragonflies diet. It has yet to be quantified, but it is thought that dragonflies act as a biological control of malarial transmission. Great post, but your woodlouse comparison unfortunate “They are insects with a purpose, unlike a woodlouse” but of course, a woodlouse is a crustacean with a purpose! Woops! Caught me there! Thanks for visiting!